Combine the sake, sugar and ginger in a small saucepot. Place over medium heat for two minutes, or until the sugar is just dissolved. Transfer to a dish just large enough to hold the sirloin tips. Add the soy sauce and fresh chives, then add the sirloin tips. Marinate refrigerated for 3 hours. To cook, grill or broil until the steak reaches the desired doneness — about 3 to 4 minutes for rare, 5 to 6 minutes for medium and 8 to 10 minutes for well done, depending on the thickness of the tips. Let stand 5 minutes before slicing and serving (which leaves you just enough time to toss the salad!). Combine the vinegar and oil in a large salad bowl. Whisk vigorously to blend. Immediately add the salad greens, radishes and peas. Sprinkle lightly with salt and pepper and toss well. 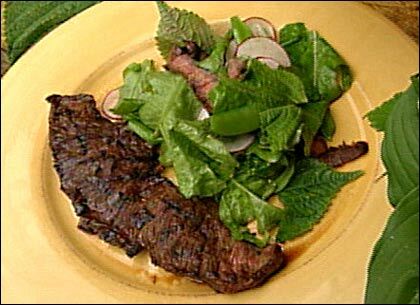 To serve, either toss in the sliced sirloin tips, or mound the salad into the center of a chilled salad plate and arrange the steak strips over or around the salad. It's your salad, do as you like! This segment appears in show #3013.